While many of you have seen Doug Kaufmann’s t.v. show “Know the Cause”, today’s blog provides a visit behind-the-scenes to Doug’s broadcast studio. Seagate was Doug Kaufmann’s first sponsor in 1997 when he originally aired his health talk show called “Your Health Matters” on the radio. Seagate continues to be a major sponsor of Doug’s television program “Know the Cause” that he produces in his own studio located in Rockwall, Texas. 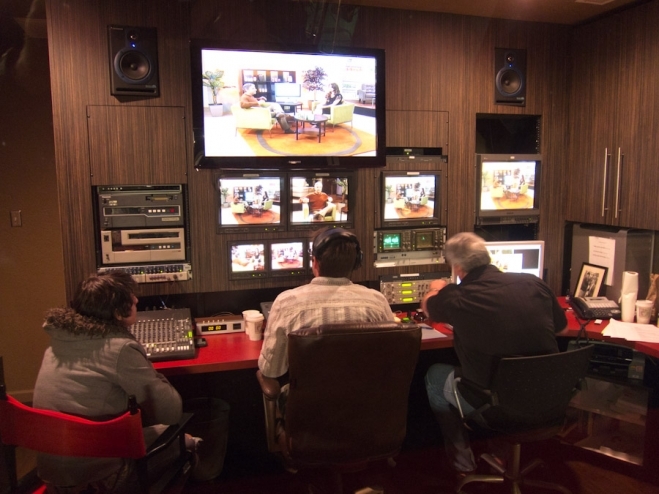 The photo below shows a small section of their broadcast control room. A full-time crew of 8 people man the control room. In addition, there are 4 cameramen, plus a production manager and broadcast manager. Producing an entertaining and educational show about staying healthy involves a lot of work, research, and talent. The most important talent is Doug, pictured above focusing on the opening segment of a new show. Doug’s show has no script and no teleprompter. People actually think and talk about subjects based upon their knowledge and experience. 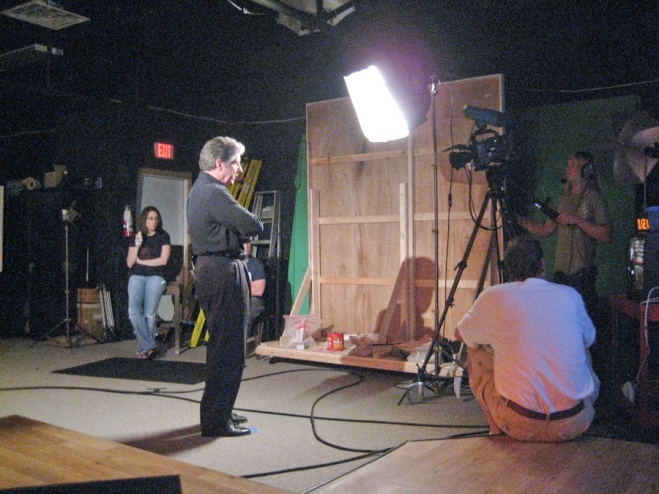 On occasion, the outline of what to film and how to interview are developed by Doug and his guests immediately before each interview or as a show progresses. On August 30th , Richard and Heather were in Rockwall to tape several shows. 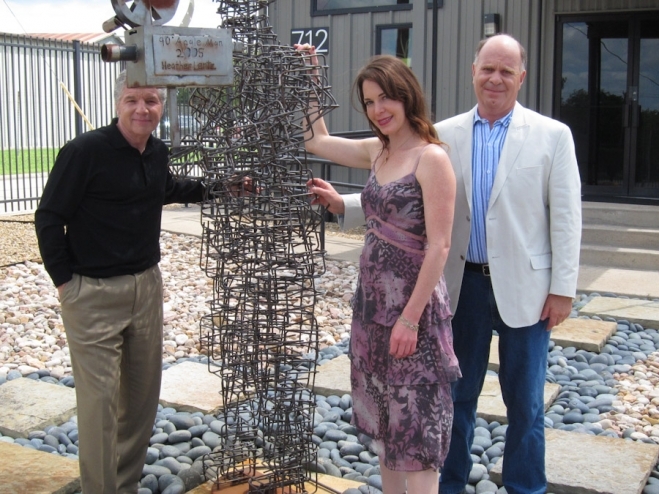 For Heather, this was also a reunion with the metal sculpture she had welded for Doug in her shop which is now installed at the entrance to Doug’s t.v. studio. Prior to filming, the studio set must be prepared and the guests wired with their microphones. In the photo below, Heather is carefully positioning her microphone. This was the first time for Heather being interviewed on television. However, she was cool, calm and well-prepared for her interview. In fact she was doing so well that one segment was filmed solo with just her and Doug. During filming, monitors around the studio show the show as it is being filmed. The clock on top of the t.v. monitor counts down to zero for each segment being filmed. Once the clock reaches zero, filming is stopped and commercials are inserted into the show. “Your Health Matters is broadcast throughout the U.S. on cable, CTN, local and network stations. You can locate a station to view this show on Doug’s website — http://knowthecause.com/index.php/knowthecause-channel-listing. This is the leading national health talk show in the U.S. The fish photo of the week below is of a Goliath Grouper. This fish is a juvenile, weighing approx. 40 lbs. The adults can grow up to 8 feet in length and weigh over 400 lbs. While most act shy or indifferent to divers, they have been known to occasionally become aggressive and charge divers, though there are no known fatalities to anyone from an attacking grouper.